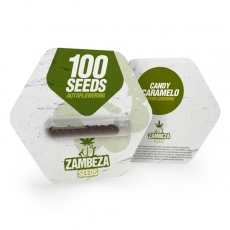 Candy Caramelo Autoflowering by Zambeza Seeds is the autoflowering variety of their feminized Candy Caramelo which shines with the same qualities as the original despite being an easy growing autoflower. Her first-grade genuine Spanish cannabis genetics make for an incredibly sweet and tasty smoke experience and a plant of exceptional beauty! Sometimes, creating an autoflowering variety of an otherwise excellent strain may mean having to accept some compromises here and there. Not so with the excellent Candy Caramelo Autoflowering by Zambeza Seeds! Despite her being easy to grow so that even new growers will be rewarded with results in no time, Candy Caramelo Autoflowering really doesn’t need to hide from her bigger, feminized sister. Cream Caramel, the strain who gave her good genetics for this variety, is a Spanish classic loved by growers and cannabis connoisseurs all across Southern Europe and elsewhere. It’s thanks to her excellent Mediterranean genetics that Candy Caramelo delights with a lot of good qualities. You can harvest her sweet and aromatic buds in record time thanks to her short life-cycle of only 50-60 days. Indoors, you can look forward to yields of up to 400g/m² and if you grow her outdoors you can expect up to 150g per plant. Her height stays at a very manageable 60-90cm and gets only a little taller when you grow her outdoors. This makes Candy Caramelo also a good choice for stealth and guerrilla grows. What sets good Spanish weed apart from many other varieties is, among other things, their amazing flavour. Candy Caramelo is no exception. She adds a slight but perfectly accentuating minty touch to her sweet aroma, making for an unforgettable smoke that will make you want more and more of her. Her effect, although she only measures a moderate 15% of THC will give you a great tingly feeling along with a boost of energy and creativity. This makes Candy Caramelo an excellent daytime smoke that you can enjoy over and over. Candy Caramelo Autoflowering is a superb autoflower that won’t let you down! The indica-dominant Spanish beauty delights with a fantastic flavour and pleasant uplifting high that isn’t too powerful, making Candy Caramelo a smoke where you will have a hard time not to fall in love with. 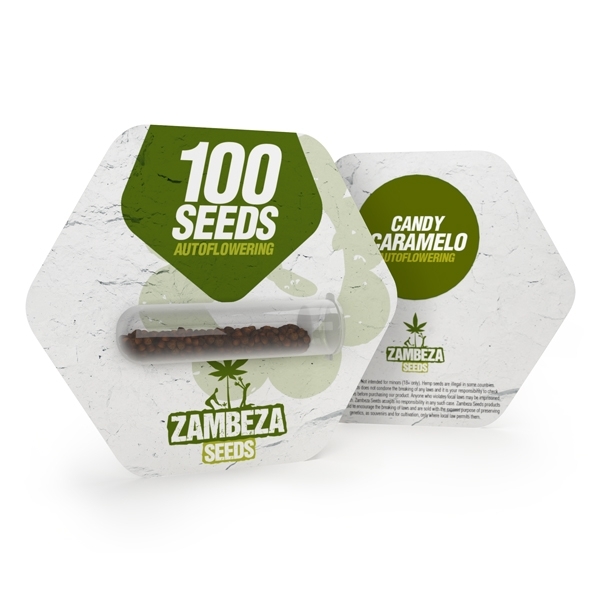 At Zambeza, you can get Candy Caramelo Autoflowering bulk seeds in packs of 100 seeds so you can get more seeds of this wonderful autoflowering variety from Spain!